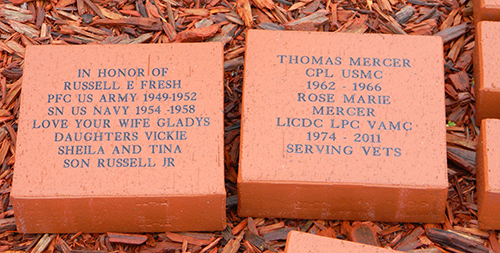 These custom laser etched paving bricks line the walk way in the Ohio Veterans' Memorial Park. These kiln fired bricks are extremely wear resistant and will hold up for generations. The lettering is baked with a ceramic coating with your custom message to your soldier or Hero. These are a great way to thank our friends, family and others who have served our country or just a general "Thank You" to our troops. These special memorial pavers are are available for all veterans who served, from any state. There are two sizes of brick available, the 4" X 8" paver and the 8" X 8" paver. stop out at the park sometime and talk to one of our volunteers. Click Here to visit our Imgur gallery to see photos of other memorial pavers for ideas. Via Check or Money Order Click on a link below to download a PDF file that can be filled in and mailed. AT THE PARK Our board members can collect your order at the Ohio Veterans' Memorial Park. Please call (330) 529-4001 to make sure we have someone on-site. We are generally there on the weekends and evenings during good weather, but can make arrangements to meet you there anytime.